Like most woodworkers I have a variety of glues for various projects. I was sent a sample bottle of through the Handyman Club. To be honest, I tried this with some trepidation but was pleased at the results. On metal to wood it held every bit as well as Gorilla Glue which I normally use. 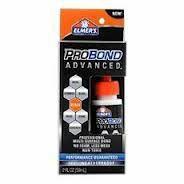 Whereas polyurethane glue expands and oozes, Elmer’s ProBond Advanced performed without the messy cleanup. I can only testify to how it worked on the projects I did. The first project was wood to wood and I was not very impressed. I attempted to repair an old scroll saw nameplate my wife got 20+ years ago as a gift. I followed the instructions but it did not make a good bond. I had to clean the joint again and repair it with a CA glue. However the box plainly states that it only performs mildly well on wood to wood. With 20 year old, dried out pine, I cannot hold this against the product. Next came the real test, would it hold up to it’s claim of excelling in multi-surface gluing? Again I followed the instructions, clean surface, scuffed the metal, thin even coat, hold the parts together a few seconds and then clamp for 2 hours. 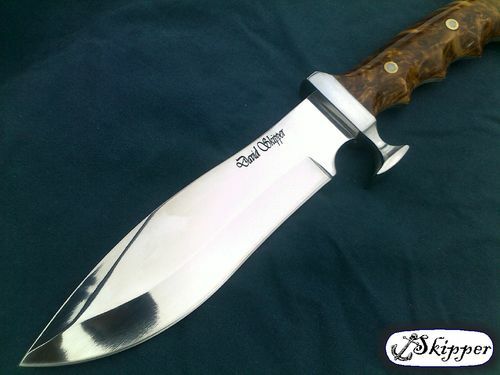 On the knife shown and one other, I used stabilized wood (Cottonwood Burl and Flamed Box Elder, end grain) it held great! I was able to glue, and then completely shape and sand one knife and rough in the other in one work day. I am currently working on a knife that I used this glue to bond non stabilized Elm Burl and so far so good!! That beats waiting over night like I do when I use an epoxy or the clean up that comes after using Gorilla Glue any day. Good review. I bought Elmer’s wood glue last time, because I hate the Titebond caps, and really like it. It grabs fast and holds wood as well as any other yellow glue I’ve used and the cap isn’t annoying. funny that it can bond wood to metal , but not so much wood to wood. 5 stars worthy ? I also thought it is odd that it did not do well with gluing wood to wood as well. That alone made me wonder how could it bond wood to metal? However I could feel its bond within the few seconds you are instructed to hold it before clamping. I gave it a 5 star because it does not claim to be great at wood to wood. Its main purpose is multi-surface gluing and it did great job there. This is my first review of anything anywhere. Funny that I posted more info here then on the testers site. Seemed like reviews here are read and we interact more here. That is why I really do love that I found Lumberjocks!! Interesting. I often have to glue multi surfaces, and have been using industrial epoxy for years. I might just give this a try. Did you try to break the bond? If so, did it break the wood or the bond? Tennessee, you raised an important question. No I had not tried to break the bond. However I went back and did just that after your post. I used 1/2” wide square stainless steel and glued to it Douglas Fir, Walnut, Poplar, Cocobolo. All took considerable effort ( I wish I had a way to measure how many pounds per square inch it took). It did seem that the harder the wood, the easier to break the bond. With all of the hardwood test the glue broke first with the exception of the poplar in which most of the wood came off but a decent splinter remained. The douglas fir held tight and the wood broke first. I had to sand down the rest of the fir to clean the steel.